The great austerity versus spending debate has been growing louder. The crescendo will likely be reached in the final run-up to the 2010 mid-term elections. This debate will rage for the next several years. At some point the sheer size of U.S. government debt issuance and the unsustainably low present interest rates will collide. The U.S. government will sell over $2.2 trillion worth of debt this year and pay $400 billion in interest on this debt. The only reason the interest expense is so “low” is that we are paying an average interest rate of 2.4%. 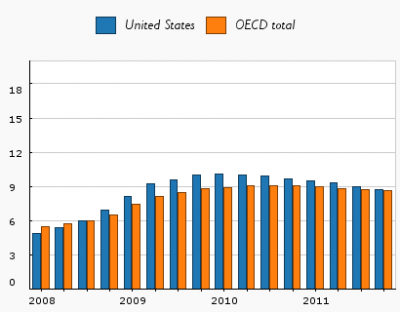 In the three-year period from 2008 to 2011 America will pay and has paid, $847 billion in interest on the national debt. America is now somewhere between the long, slow slide of the Japanese economy — the land of the rising sun — and the austerity drenched emerald isle — Ireland. Ireland has slashed and enabled the market to begin to correct for the excesses of debt and speculative growth. Japan has tried to ease and stimulate its way out of what has become a 20-year soft patch. 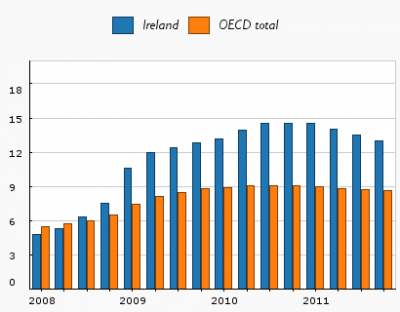 Ireland’s GDP has fallen more than 7% and her unemployment rate is over 13%. 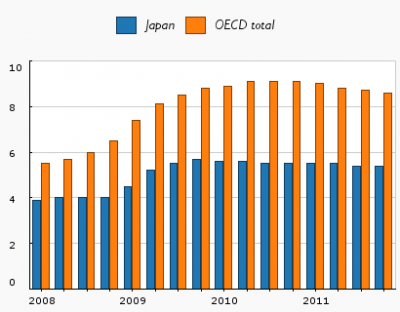 Japan has seen very low growth for nearly 2 decades. However, Japan has managed remarkable social cohesion and low unemployment. Below you will see the three nation’s unemployment charts as measured by the Organization for Economic Co-Operation Development (OECD). Japan has seen an enormous run-up in government debt and Ireland is suffering to prove its bona fides to bond markets and investors. These two nations are vastly different from the U.S. and from one another. However, they might function as bookends to the present debate in the U.S.
All graphs display the U.S., Irish and Japanese unemployment rates against the average rate for the 33 developed nations of the OECD. The serious and persistent problems in the U.S. economy have created an environment where policy makers and pundits scream for greater proximity to either the Japanese or the Irish approach. I would argue that the Japanese, American and Irish approaches all involve the same mistake. Obviously, the circumstances and options open to each nation are different. No nation can fix structural problems with cyclical approaches. When the old structure is seriously broken a new structure must be built. The other choice is to attempt to speed up or slow down the adjustment process. This is done by meddling to smooth the business cycle or bracing for impact. Massive doses of government spending can reduce pain and slow adjustment. This has been the Japanese approach. Harsh market medicine will make a shorter more savage correction. The Japanese style approaches risks by staying down longer. The Irish medicine risks mass suffering fueled by political instability and wounds that fester and cripple. The bigger point is that this does not have to be the path that we follow. We can try a third way. We can confront that the structure of the U.S. economy needs to be adjusted and use market intervention to ease and speed the arrival of new and sustainable economic arrangements. This is absolutely not what we have been doing. America needs to spend less, save more and generate jobs. This must be done with decreasing government spending and a shift in the nation’s tax burdens. Labor needs to pay less in taxes — to grow jobs and assist the recovery in middle class households. This means that capital and profit will have to pay more of the total bill. The more growth our structural shifts generates, the less the increase in tax burden and the less the reduction in government spending that will be required. We have to re-invest in education, infrastructure, health care, public goods and reducing national debt. The costs, results and sufferings of our present issues in health, education, infrastructure and transport shorten and lower our life standards. These shortcomings are also crippling our competitiveness. Spending in these areas — more importantly changing how these areas function — is not mutually exclusive with balancing budgets. In fact, we can’t balance the budget without confronting where our first place spending is not generating world-class results. Our economy is structurally unsound. That means we need to change a portion of how the economy functions. Ours is not a simple question of less or more state involvement — although that is what we hear from most folks — left, right and center. We need to shift what gets taxed more and what gets taxed less. We need to slowly shift back to a system where the vast middle class can get jobs that earn enough to live. America will not be as relatively rich as she was for most of the period since WWII. This will still be a rich country. Our middle class will need to spend less on private consumption than what was spent from 2002 to 2007. Our lives can still be better! This means more public goods and more savings. Public transit, parks, health care, education and community development enrich many more lives at much lower cost than private pools dug in behind unaffordable McMansions. It’s time to let go of the notion that all change means decline. It is time to concentrate on facilitating the structural evolution of the U.S. economy. If we don’t, we are in for years of stifling debate in a deep growth valley between the Japanese and Irish paths.